The WordPress.com stats helper monkeys prepared a 2013 annual report for my blog. Doesn’t it look great? When Blizzard launched Diablo 3, people raged about always-on DRM. There was no single player, because of the auction house and they wanted a more ‘social’ experience, allowing your friends to jump in at any time. Now I’m playing Hearthstone in beta, and I noticed that this is also always-on. I don’t like it. Not at all. I noticed the always-on when I played the tutorial. When you start the game for the first time, you have to play a few rounds to get used to the mechanics. During the last tutorial, one card away from winning, my internet disconnected (yay, wifi) and I had to redo the whole match. This also happened later when I was playing in practice mode. These modes can be offline, and I would really like that. My wifi wavers a lot and I notice these lags during a play against AI. I don’t see what my card does, I’ve to wait two to three seconds before I can play another card. It annoys the hell out of me, mostly because I lose my flow. This is even more annoying in PvP, but that can’t be helped. I would like to know what you think. Should AI battles in Hearthstone be offline? Is Always-on essential to Hearthstone? I finally got one, but not from Blizzard. Hearthstone is Blizzard’s new WoW themed card game and is currently in beta. The game will be free to play when it’s released, but will have microtransactions. You can buy booster packs with gold, the in-game currency or with real money. I checked yesterday and it’s €44, 99 for 40 packs. Each of the packs you buy with real money has a guaranteed rare or higher. The packs you buy with gold don’t have this guarantee. I will post more about Hearthstone. If you also have access to the beta, feel free to add me. My Battle tag is on the right side of the page. Sometimes a seagull steals your fish. Or, sometimes life doesn’t go the way you want it to. A few months have gone by without a post from me. For several reasons. I didn’t know what to write, or how to write it and when I did write, it wasn’t for this blog. I had to write a big report for work, a whole 175 pages. I was very proud of it when I finished it and they were happy as well. Another company offered me a better job while I was still working on that report. Changing jobs means making arrangements of all kinds. Handing in your resignation, writing more documents to make the transfer easier and making sure the commute to the new job is arranged. So that and other private matters kept me from writing. These past few months also made me realize something. I want to write, badly. Not just blog posts, but stories. I already had the idea of making a website about narrative design, which would also be part of my writing portfolio. So that’s also something I’m working on. I will still post to this blog when I can find the time between my full time job, resting, my boyfriend and my other website. I probably have to learn some things about time managements. PS. I took this photo at Texel, Ecomare. 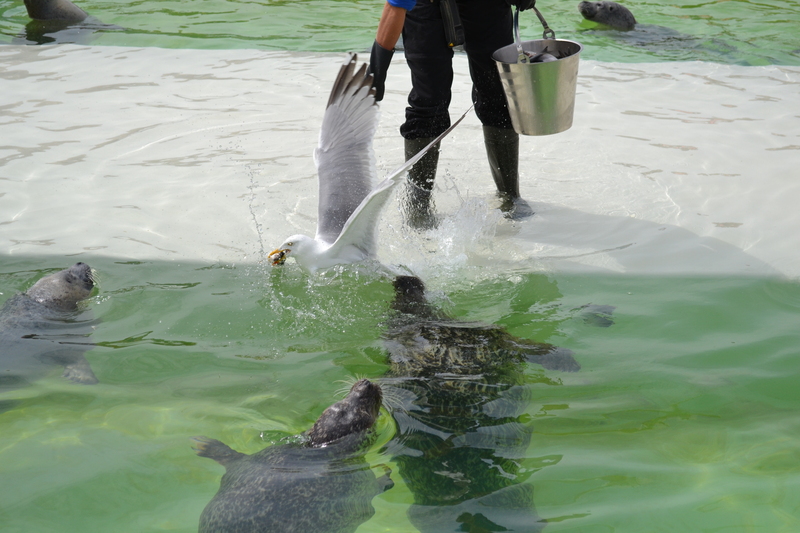 They take care of sick/stranded seals and birds and set them out again when they are healthy. These seals are old or unable to survive in the wild.